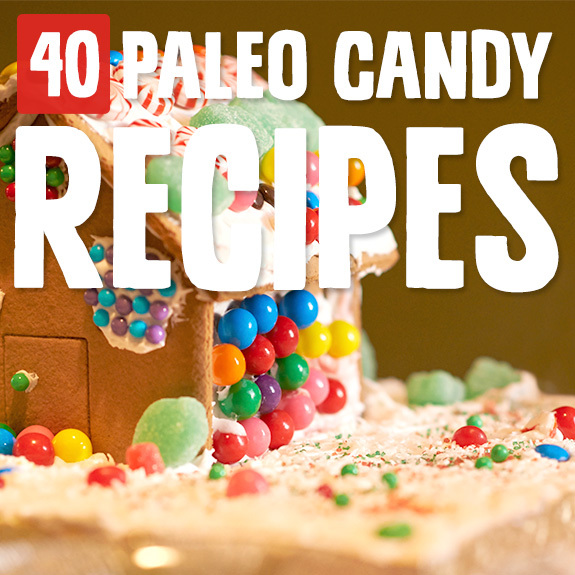 These paleo candy recipes will please kids and adults a like, and there are a wide range of candy types of choose from, including chocolates, fruity candies, licorice, and more. 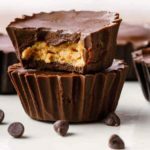 These creamy-dreamy little treats are a unique paleo take on the familiar peanut butter and chocolate cup. You can make them with Enjoy Life dark chocolate chips (or another favorite brand), coconut oil, smooth cashew butter, raw honey, and vanilla extract. You’ll want to give some of these away so you don’t accidentally eat all of them by yourself! 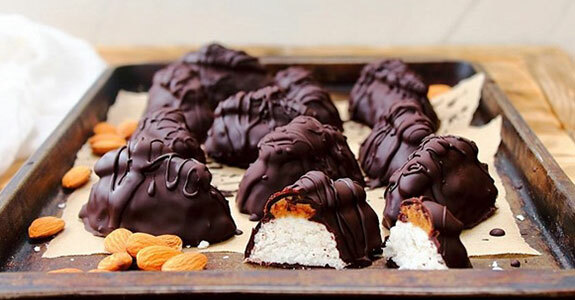 Make them with shredded dried coconut, coconut oil, coconut butter, coconut cream, vanilla bean, stevia, almond butter, dark chocolate, and vanilla. Yummy! For me, pecans are one of the most decadent nuts. They’re soft and rich, so blending them into a butter is easy and delicious. 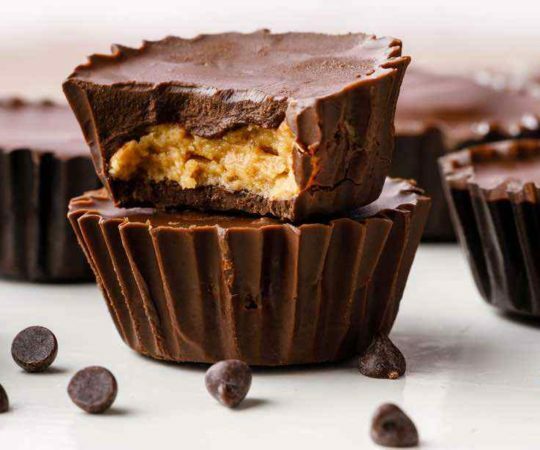 These cups are made with pecan coconut butter (homemade) and a chocolate coating using chocolate protein powder for extra protein. Didn’t you used to love popping a chocolate caramel into your mouth, letting the chocolate melt off, and sucking on the caramel until you couldn’t stand it anymore and had to bite into the chewy goodness? Make this version without any sugar or high fructose corn syrup! This vegan and paleo-friendly fudge is made with full fat coconut milk, agave nectar, dark chocolate, coconut oil, and instant espresso (you could always use coconut nectar or even maple syrup if you wanted something less processed than agave). The espresso really brings out the chocolate flavor while also adding its own twist. 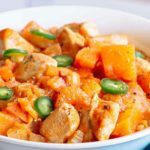 Want something perfect for autumn with all that warm and spicy pumpkin flavor? For this one, you’ll need coconut butter, pumpkin puree, honey, cinnamon, nutmeg, allspice, ginger, cloves, cardamom, sea salt, and chopped dark chocolate (the darker, the better!). 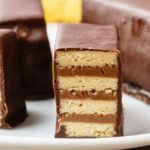 This bark is painfully easy, it almost isn’t even a recipe! But if you’re pressed for ideas and need a quick gift or treat, click ahead! This bark is made with dark chocolate, salt, espresso powder (optional), pumpkin pie spice, dried cranberries, and pumpkin seeds. Here’s another take on the combination of dates and chocolate. This one uses almond butter, vanilla extract, sea salt, coconut milk, chocolate chips, coconut oil, and pitted dates—medjool is my favorite for this kind of recipe, but any date will work. 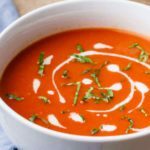 I love this brilliant idea, and you won’t believe how good it tastes. All you need is watermelon and sea salt, and you’ll dehydrate the watermelon in a food dehydrator and sprinkle with sea salt before rolling it up. I love to do this with strips of dried pineapple, too, and I bet it would work with lots of slice-and-dehydrate type fruits. Mango, maybe? 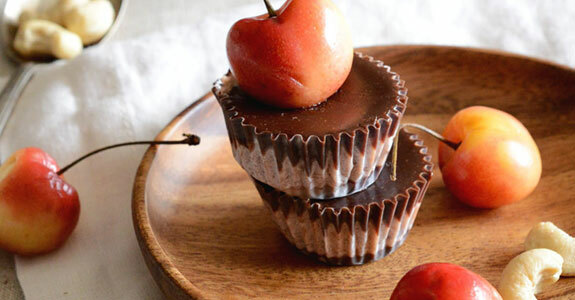 Cherry and chocolate were pretty much made for each other, and that’s pretty clear from the absolute heaven that is these chocolate cherry cream cups. They’re raw and made with cocoa powder, almond butter, maple syrup, coconut oil, cashew butter, cherries, and vanilla. This innovative recipe uses pitted dates and anise exract to make homemade licorice candy that’s chewy and totally delicious. As an optional added treat, you can make raw chocolate to dip and coat your finished licorice pieces, giving them an extract boost of goodness. For a sophisticated, grown-up candy snack, try these walnut clusters bound with delicious melted chocolate chunks. The candied walnuts are homemade, with coconut oil, raw walnuts, sea salt, maple syrup, coconut sugar (instead of the xylitol), and cinnamon. Treats like this are so easy to make, but they’re always worth sharing! When you freeze your dates they’re like a rich caramel candy, and filling with your favorite nut or seed butter adds decadence. Add a sprinkling of cinnamon for an absolutely lovely flavor. Because they’re frozen, you can make as many as you want and store them in the freezer for quite a while. 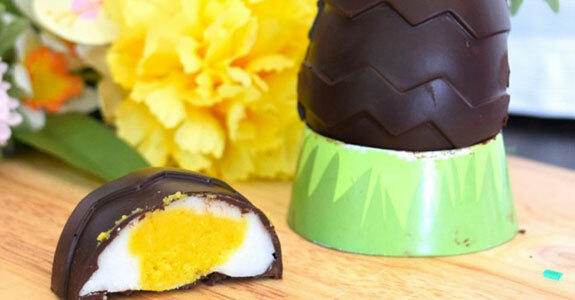 Free of grains, dairy, sugar, and common allergens, these cream eggs are absolutely tasty and perfect for Eastern. Make them with coconut oil, coconut cream, honey, sea salt, vanilla turmeric (for the bright yellow color!) and dark chocolate chips or chunks for the shells. Perfect for Passover, these jelly rings have only 3 ingredients and they’re so easy to make you can have them in your mouth in under 20 minutes. You’ll need coconut oil, dark chocolate chips, and homemade raspberry chia jam (or your favorite chia jam flavor). Fruity and chocolately all at once! These mini almond cups are made with raw almonds, shredded coconut, almond butter, dates, pure vanilla extract, sea salt, and a top chocolate layer with coconut butter, coconut oil, maple syrup, and cocoa powder. They’re super tasty and very simple! I love marshmallows. Homemade ones are a world above store-bought marshmallows, with gentle sweetening and in this recipe, an aw awesome peppermint flavor, crushed paleo-friendly candy canes, chocolate chips, and honey. 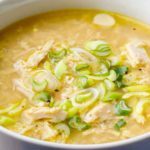 Yummy and kid-friendly! 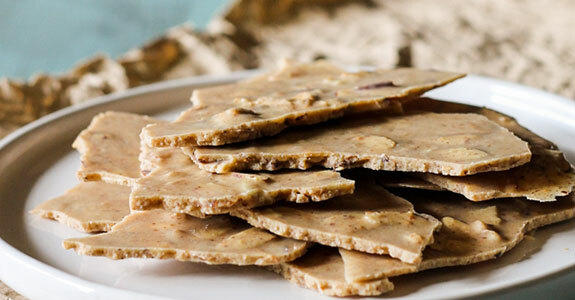 This yummy bark is made with coconut oil, almond butter, vanilla bean, sliced almonds, and sea salt. 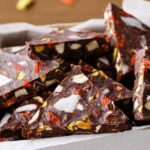 It’s a different take on chocolate bark that has no chocolate, and it would make an awesome gift. You could even add your own toppings to switch things up! Love coconut? Try these double coconut cups with a bottom layer of coconut butter and a top layer of toasted coconut butter, sweetened with pure maple syrup and a bit of granulated stevia for just the right amount of sweetness to enjoy as an afternoon treat. These vegan and paleo slices are made with raw cacao powder, coconut oil, maple syrup, almond butter, vanilla, and sea salt. 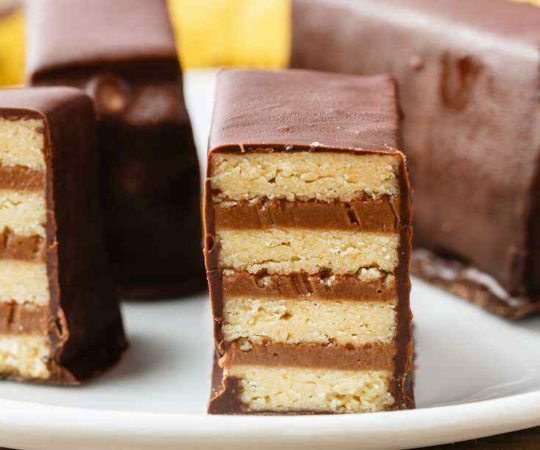 They’re super easy, and have a lovely caramel flavor with a maple sweetness and sandwiching layers of dark, melty chocolate. 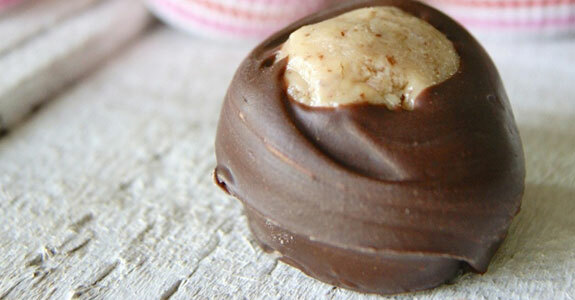 Anyone else have peanut butter buckeyes at their holiday parties? Those candies are delicious, but usually filled with lots and lots of powdered white sugar, and if course peanut butter. 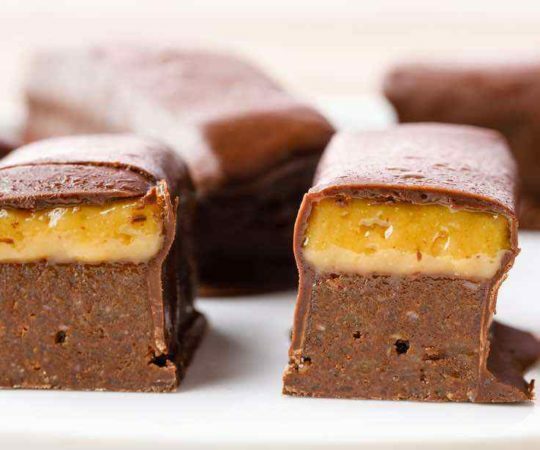 Try this paleo version made with coconut and almond butters, coconut oil, vanilla, honey, and dark chocolate. Need a simple treat that’s sophisticated and perfect for the dessert at a grown-up dinner party? Try these salted chocolate almond haystacks made with nothing but sliced almonds, dark chocolate, and Cyprus flake salt or coarse, flaky sea salt. I think marzipan is the best ever. 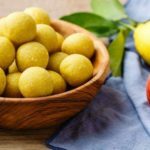 I know that’s an unpopular opinion, but when you try these paleo marzipan cake pops, I’m sure you’ll be converted. They’re made with blanched almond flour, maple syrup, vanilla extract, tapioca flour, and colorful spices for dusting the outside. Everyone loves bacon, and everyone loves maple syrup. These are (pretty much) facts. Bacon candy? Yes please. 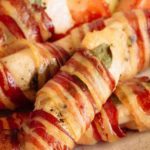 You can make it with these two ingredients by brushing the bacon with maple syrup and baking it in the oven until it’s caramelized and tasty! 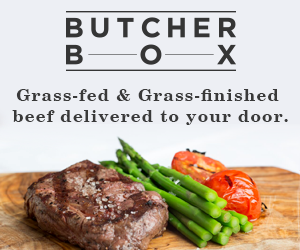 But you’ll want to make it while you’re home alone so you don’t have to share. These. Are. So. Good. 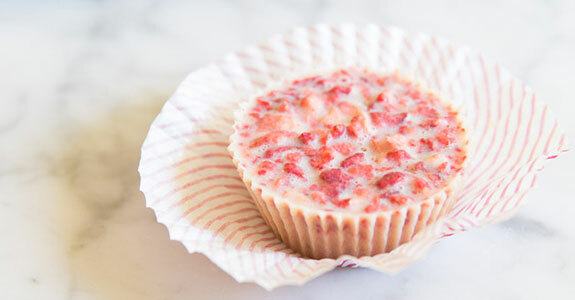 This is one of my favorite little treats to make and store in the freezer. They’re made with cocoa butter, maple syrup, vanilla, coconut butter, and freeze dried strawberries. If strawberries aren’t your thing, you could use any freeze dried fruit. You do you. 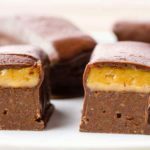 These creamy chocolate “eggs” are similar to the popular Cadbury Easter candy, and this version is paleo! It’s made with coconut butter, cashew butter, maple syrup, turmeric for color, and chocolate chips. The cashew butter is the secret to the creamy goodness of these! Making maple candy with my dad is one of my favorite things to do when visiting family for the holidays. It’s so easy, because you just boil maple syrup down into a candy! This version also has vanilla paste or extract, adding a delicious vanilla flavor. You can’t taste the avocado in these truffles, but it makes them unbelievably creamy and melt-in-your-mouth good while also adding powerful healthy fats into what’s otherwise a tasty candy. 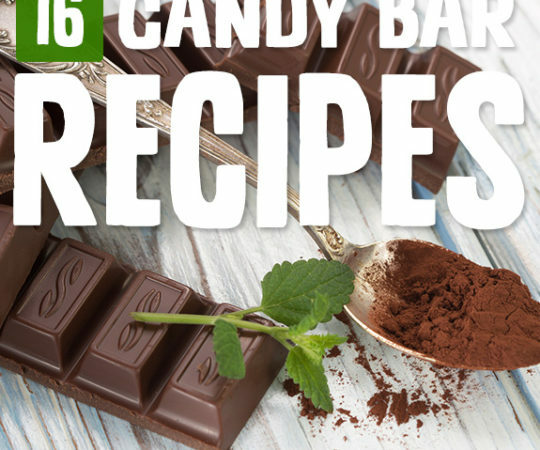 You’ll also need dark chocolate, cocoa powder, vanilla extract, and salt. These little gummies are kid-friendly, high in protein, and made with grass-fed gelatin for a healthy body. Everyone will love the flavor, created with lemon juice, honey, berry stevia drops, orange extract (optional), and natural food coloring (also optional). Junior Mints used to be one of my favorite movie theater candies—a thin chocolate outside with a soft, minty center. 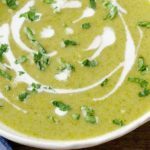 This paleo version is even better, with coconut butter, peppermint extract, chocolate, and almond milk. It doesn’t even have any added sweetener! These chocolates taste like the holidays, and they’d make the perfect gifts to give to family and friends who love food. They’re made with vanilla, coconut powder, almond and coconut flours, and a homemade cranberry maple syrup that’s divine. This little guys are so cute, jiggly, and delicious! Of course, you don’t have to make robots if you don’t have a robot mold. You can make whatever shapes you like, or just pour the liquid into a pan and cut into squares when it’s fully set. It’s still awesome! These decadent caramels have only three ingredients! 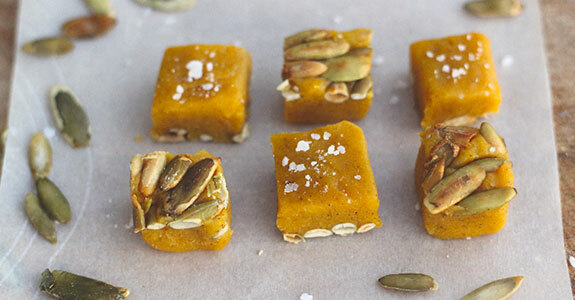 You’ll need honey, coconut oil, and pumpkin puree. It’s also recommended to add pumpkin pie spice. These caramels are so easy to make, and the coconut oil combined with honey makes them chewy and perfect. It makes me shudder to think of it now, but my favorite “lunch” as a kid was white bread with peanut butter and marshmallow fluff. Healthy, right? I’d come home from school and eat the fluff off a spoon! 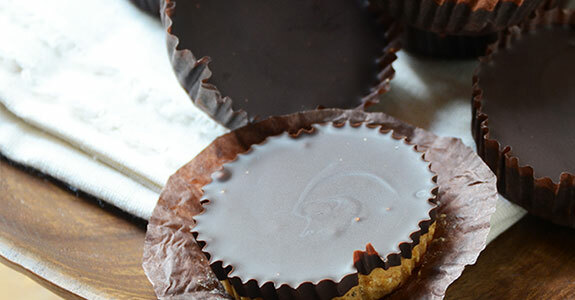 These fluffernutter cups with almond butter are a much healthier way to indulge. These tiny skulls are perfect for Halloween, or really any time your little monster wants a scary treat. They have a white chocolate coating made with vanilla, cashews, coconut oil, and almond milk, and a berry filling made from goji berries and fresh blackberries. 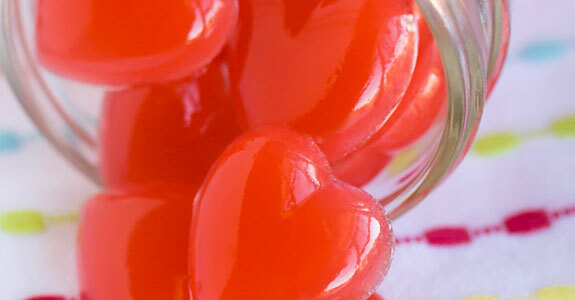 These healthy gummies will make you a very popular parent. They’re beautifully colored and flavored with fresh watermelon and lemon juice, creating a pink gummy with a sour watermelon flavor. You can make whatever shapes you want, but I love these little people. 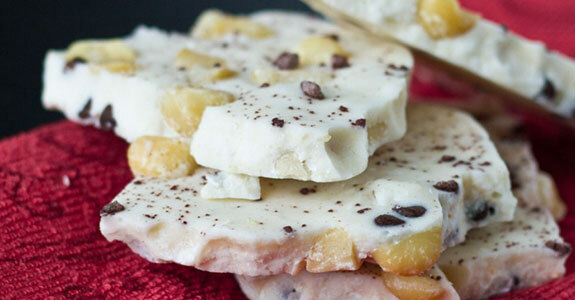 If you love chocolate bark and want to try something similar but different, try this coconut cream bark made with macadamia butter, chocolate chips, vanilla extract, coconut butter (also known as coconut cream concentrate), and coconut oil. 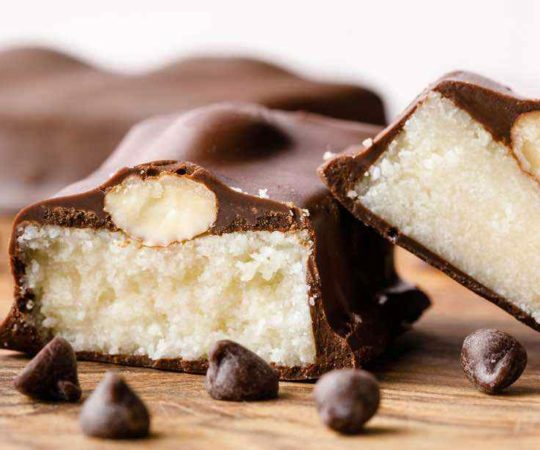 This candy is made with shredded coconut, coconut oil, agave nectar or honey, macadamia nuts, and bittersweet chocolate. It’s very simple to make, and has a lovely tropical flavor from the macadamia nuts pressed into the candy! Finally, a grown up treat that you won’t have to share with the kids, because what kid likes toffee? If they do, you’ll just have to hide these treats because they’re that good. 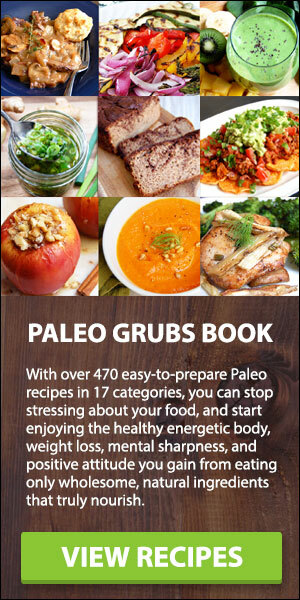 You’ll need vanilla, almond butter, coconut sugar and nectar, chocolate, and palm shortening.